Gita Jayanti is the birthday of Bhagvad Gita, the sacred text of the Hindus. It is celebrated on the Shukla Ekadashi, 11th day of the waxing moon of Margashirsha month of the Hindu calendar. It is believed the “Bhagavad Gita” was revealed to Arjuna by Krishna Himself in the battlefield of Kurukshetra (in present-day Haryana, India). The text is written in third person, narrated by Sanjaya to King Dhritarashtra as it transpired between Sri Krishna and Arjuna. Sanjaya, the secretary of the blind King Dhritarashtra, had been blessed by his Guru, Vyasadev, with the power to remotely view the events taking place on the battlefield as they transpired. This year Gita Jayanti will be celebrated on November 30. All temples of ISCKON in the globe celebrate this day with proper rituals and offerings to the God. Apart from holy bath, puja of Lord Krishna can be performed at home with aarti at the end. Since, it is celebrated on Ekadashi, it is important that devotees who fast on this day do not consume any kind of grains like rice, wheat, and barley. There have been many organized celebrations taking place to teach the value of Dharma to the youth of today through explanation of the Gita on this special day. The Bhagavad Gita is considered by many Hindus to be the holiest of all the scriptures in Hinduism. It is one of the most often quoted Hindu scriptures within Indian (and perhaps even Western) literature. The Gita is a central treatise of the expansive epic, the Mahabharata. It is often referred to as the jewel in the crown of hindu philosophy and religious thought. 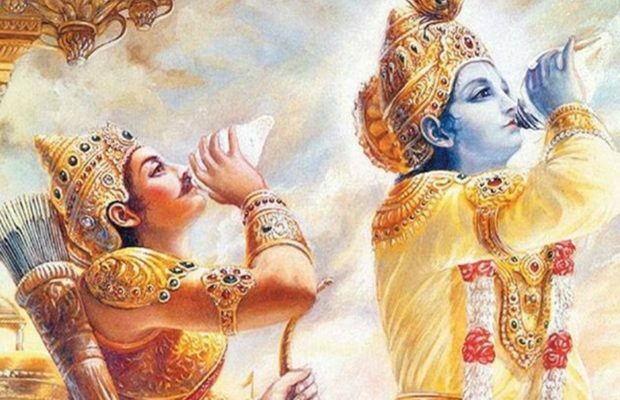 The Gita consists of 18 Chapters and 700 verses that formed the discourse given to Prince Arjuna of the Pandava dynasty by Lord Krishna on the battlefield of Kurukshetra. Be the first to comment on "Know significance of Gita Jayanti"